April 6 – the anniversary of the Declaration of Arbroath – will see around 30,000 people gather in New York for the centrepiece of the week, a Tartan Day parade led by Sir Billy Connolly. Professor Marjory Harper, a historian from the University of Aberdeen in Scotland, has spent years researching the stories of the emigrants who set sail for a new life on the other side of the world. As part of her work, she has spearheaded the creation of a free online tool, The Scottish Emigration Database, which contains the records of 21,000 people who set sail from Scottish ports to cross the Atlantic. It lists details including the town or village of origin, address, occupation and destination for passengers who embarked at Glasgow and Greenock for non-European ports between 1 January and 30 April 1923, and at other Scottish ports between 1890 and 1960. It also gives information about specific vessels and the shipping lines to which they belonged. 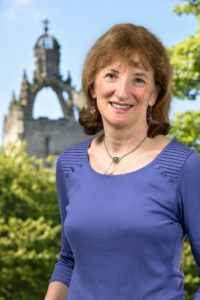 Professor Harper said that she and her colleague, Dr Nick Evans, had focused initially on 1923 as the year saw a record number of 89,000 people emigrate from Scotland. and while most emigrants came from the Central Belt, 595 passengers left the Hebrides in a single week on two ships, the Marloch from Lochboisdale and the Metagama from Stornoway. As many of the descendants of this Scottish diaspora mark their heritage in the Scottish Week celebrations, it is timely that we consider the factors which led their ancestors to seek a new life. The database is a great starting point for this. Professor Harper is visiting the United States to discuss the Scottish diaspora, using personal testimony as a lens through which to view the complex and often contradictory saga of Scottish emigration. She will speak at the University of New Mexico in Albuquerque on March 29 and at three events in New York and Chicago during Scottish Week. In her public lectures she will quote extracts from more than 100 interviews with emigrant Scots that she has conducted in recent years. One of those interviewees sailed on the Marloch in 1923 and appears on the Scottish Emigration Database. Scottish Week will be a trigger for many of those of Scottish descent to think about the reasons their forebears came to America and the journeys they took. The database – and the feedback we have had from it – provide insights into some of these issues. It is therefore a useful tool not only for those investigating their own family history but for anyone who is interested in understanding the wider context of the unprecedented Scottish exodus of the 1920s. It shows us, for instance, how post-war unemployment in the central belt led to massive disillusionment and a high departure rate, not least among shipyard workers who had been – or feared being – laid off. Despondency among Hebrideans that long-standing problems of land hunger had not been resolved was intensified by lingering despair in the aftermath of the Iolaire disaster. More positively, the introduction of the old age pension in 1908 meant younger people had fewer qualms about leaving elderly parents and seeking opportunities overseas. Many in this group found their horizons had been opened up by war service, particularly those who had served alongside soldiers from the Commonwealth. The introduction of government subsidies in 1922 also helped, as did the persuasive tactics of recruitment agents. Personal connections, however, had always been the key ingredient in decision-making, and remained so after the war. Mary Watson, who lived on the edge of the University of Aberdeen’s campus at 40 College Bounds in Old Aberdeen is one of the 21,000 entries in the database whose experience demonstrates the importance of such links. Aged 24, Mary emigrated to the United States in April 1923, on the SS Cameronia from Greenock. Mary Watson’s details demonstrate the transatlantic travelling arrangements of a single female in the 1920s. She sailed unaccompanied, which was quite common, but – unlike most domestic servants who emigrated before the war – she could afford to take a passage in the second cabin. During the first four months of 1923, 876 other domestics also emigrated from Scottish ports. Like Mary Watson, 304 women went to the United States, whereas 572 gave Canada as their destination. In terms of place of origin, Mary was one of 896 emigrants from the city of Aberdeen who went to the USA and Canada between 1 January and 30 April 1923. By linking evidence from the database with the records of the US Federal Labor Department held at Ellis Island, we can pinpoint Mary Watson’s arrival in the United States and glean some further details about her. For instance, she had never visited the country previously, and she was emigrating in order to join her sister, Minnie Watson, In Manhattan Avenue, New York. Mary had paid her own passage, was able to read and write in English, was 5ft 4in tall, with brown hair, grey eyes and a fair complexion, and she was in good health. She was a native of Aberdeen whose previous address was not her place of employment but the family home, where her mother, Mrs Bella Watson, lived. Professor Harper will participate in a panel discussion on Scottish migration to America at the Carnegie Hall, New York, on April 2. She will speak at the Chicago Scots Scottish-American History Forum on April 4 and at the New York Genealogical and Biographical Society on April 5.